"New York State Senator Jessica Ramos said addressing a small press gaggle on Thursday morning. Until recently that statement might have been a reference to the ugly and highly public fight to renegotiate Amazon's disastrous HQ2 deal. Instead, the new battleground is a future warehouse the ecommerce giant plans to take over in the residential neighborhood of Woodside, Queens, just over three miles from the site HQ2 was slated to occupy. 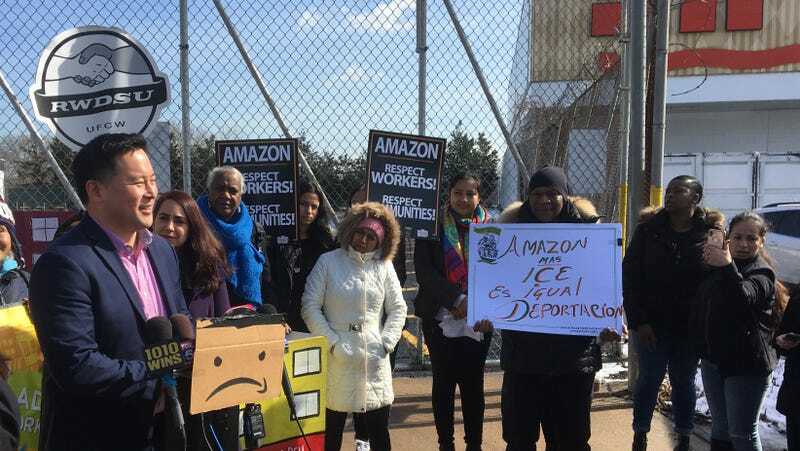 ,000-square-foot warehouse formally occupied by a wristwatch company in October, and did not wring any economic sweeteners out of borough or city to move there, at least to Senator Ramos's knowledge. Still, Ramos, State Assembly and current Public Advocate candidate Ron Kim, and representatives from NYCC, DRUM and ALIGN advocacy organizations, (all mainstays of protests against HQ2 in New York) turned out to stand on a patch or sidewalk bounded by a UHaul facility, a highway, a barbed wire fence, and a cemetery at 11am. Why? To strike out at Amazon's famously anti-union stance, which may have done the most damage to its chances of opening its proposed Long Island City headquarters. Retail, Wholesale and Department Store Union came out to support the effort. "I think this narrative about" we don't want jobs and we want to cut our nose to spite our face "is inaccurate. We actually do want jobs, ”Camille Rivera, the National Political and Legislative Director RWDSU, said, pushing back against similar criticism directed at anti-HQ2 politicians who have been accused of costing the city 25,000 jobs. "We want good jobs, we want protected jobs, and we because Amazon is responsible when they are coming to a city like New York." finally operational, though no public date exists yet for its opening. Neutrality in the face of a union drive was a major sticking point between the New York City Council and Amazon's Brian Huseman during hearings regarding HQ2. We've reached out to Amazon to see if they'd agree to card check neutrality at this un-opened facility and will update if we hear back.